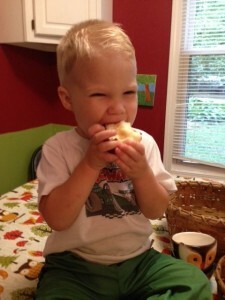 Kids of all ages will love this delicious homemade applesauce for breakfast, lunch, or dinner. Mix sweet and tart apples for a unique flavor. You can make this in small batches and refrigerate without canning, but it needs to be eaten within the week. REPARE boiling water canner. Heat jars in simmering water until ready for use. Do not boil. Wash lids in warm soapy water and set bands aside. COMBINE apples with just enough water to prevent sticking in a large stainless steel saucepan. Bring to a boil over medium-high heat. Reduce heat and boil gently, stirring occasionally, for 5 to 20 minutes, until apples are tender (time will depend upon the variety of apple and their maturity). Remove from heat and let cool slightly, about 5 minutes. 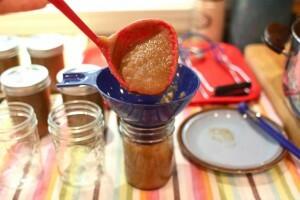 LADLE hot applesauce into hot jars leaving 1/2 inch headspace. Remove air bubbles. Wipe rim. Center lid on jar. Apply band until fit is fingertip tight.